Kenya has retreated from a proposed ban on used clothes, reversed tariff increases and held confidential meetings with US officials ahead of a decision by Washington to review duty-free access for Rwanda, Tanzania and Uganda to markets under the African Growth and Opportunity Act (Agoa). The EastAfrican has learnt that the retreat occasioned after a US lobby filed a petition accusing the four East African countries of violating Agoa rules by proposing the ban and increasing the tariffs on secondhand clothes. Lobby group Secondary Materials and Recycled Textiles Association (Smart) has filed a petition for an out-of-cycle review of the countries' Agoa eligibility and duty-free access to the US market. Kenya's Trade and Industrialisation Principal Secretary Dr Chris Kiptoo said the country had decided to enforce the policy changes to comply with the Agoa conditions. "When we saw the petition filed in March, we knew that the lobby group had strong arguments," he said. Instead of following through with the proposed ban on imports of used clothes, Nairobi pushed for the sale of clothes made at the Export Processing Zones. The review would have led to the country possibly losing its duty-free and quota-free access to the US, its third largest market. "We have determined that an out-of-cycle review of Kenya's Agoa eligibility is not warranted at this time due to recent actions it has taken, including reversing tariff increases and committing not to ban imports of used clothing through policy measures. We will continue to monitor its actions to ensure that it follows through on its commitments," said Edward Gresser, the chair of the Trade Policy Staff Committee at the United States Trade Representative (USTR). He added that, through the review, USTR and trade-related agencies will assess the allegations in the Smart petition and review whether Rwanda, Tanzania, and Uganda were adhering to Agoa's eligibility requirements. Agoa, which was reviewed last year, allows exporters from African countries that qualify under certain principles to export their goods to the US without tough restrictions. In turn, the US gets preferential treatment for its exports to Africa, including acceptance of its secondhand goods. After completing its initial 15-year period of validity, the Agoa legislation was extended in 2015 by a further 10 years, to 2025. Last year, Agoa imports to the US from Rwanda, Tanzania, and Uganda totalled $43 million, up from $33 million in 2015, according to the USTR. US exports to Rwanda, Tanzania, and Uganda were $281 million in 2016, up from $257 million the year before. In the petition, Smart is seeking to have the three countries temporarily suspended from duty-free access for eligible apparel exports to the US under Agoa, until they reverse the increased duties and stop any other activity aimed at implementing the ban. "We believe this review is warranted due to these countries' recent decision to begin phasing in a ban on imports of secondhand clothing (Harmonised Tariff Schedule heading 6309, commonly referred to as "used clothing"), which our industry exports to the region. In their effort to phase in this ban, these four countries also recently dramatically increased import duties on these goods, which is part of their plan to fully ban imports of used clothing by 2019," said Jackie King, the executive director of Smart, in a March 21 letter to the USTR. If the petition is approved, US President Donald Trump will be expected to act on the review recommendations and either withdraw, suspend, or limit the duty-free status of items from the three countries. Rwanda, Tanzania and Uganda are now expected to participate in a public hearing on July 13 in Washington. Permanent Secretary in the Uganda's Ministry of Trade and Industry Julius Onen told The EastAfrican that they are still studying the matter and will issue a formal position next week. Already Uganda and Rwanda have raised taxes for used clothing and offered incentives to manufactures to invest in their local textile sectors. Last year, Rwanda's Finance Minister Claver Gatete increased the taxes on used garments by12 per cent and shoes by 15 per cent. "The used clothes tax will be increased from $0.2 to $2.5 per kilogramme. These taxes will increase as a way of supporting locally made products and industries, while also minimising the health risks that come with the used product. I don't know if there is any trade in secondhand clothes between European countries among themselves," Mr Gatete said. 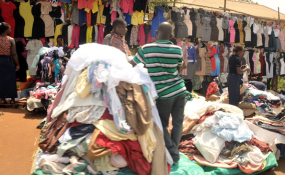 Uganda's Finance Minister Matia Kasaija also increased the environmental levy imposed on used clothes, from 15 per cent to 20 per cent of the cost, and freight insurance (CIF) value in some taxes during the post-election budget. This was done after altering the Excise Duty Act 2014 to increase taxes in the Finance (Amendments) Bill, 2016. The EastAfrican has also learnt that Kenya applied for a stay in the application of duties on EPZ-manufactured clothes if sold locally, in a bid to promote its local textile market. Under the stay, Kenyans will now be allowed to access up to 20 per cent of goods and apparel manufactured by EPZ companies, tax-free. "It is true that we applied for this stay of application of import duty and exempt-from-VAT garments and leather footwear procured from the EPZ to enable Kenyans to buy new clothes and shoes at affordable prices. This was granted by the EAC and that is how we have been able to hold the sales in Nairobi and Mombasa," Dr Kiptoo said. "There was no way we were going to appear like we were escalating the tariffs. When we met the US officials, we told them that we had actually applied for a stay in these tariffs on the used clothes from the EAC-proposed specific rate of $0.4 per kilogramme to the original $0.2 per kilogramme effective from the beginning of next month." In the 2016/17 budget, Kenya introduced a $0.4 per kilogramme duty on secondhand clothes. This has since been repealed. It is also understood that Kenya lobbied the regional countries to replace the word "ban" with "phase out" in its future communications on the used clothes, rallying the region to promote the domestic textile market. "If you look at the communique from the 18th Ordinary Summit of the EAC Heads of States held in Dar es Salaam, Tanzania, we didn't have any reference to a ban instead, we were talking about the region's commitment to build a competitive local textile industry. That is the new position, with Kenya at the forefront," Dr Kiptoo said. "The Heads of State Summit received a progress report on the review of the textile and leather sector with a view to developing a strong and competitive domestic sector that gives consumers better choice than imported used textiles and footwear, and directed the Council to finalise the matter and report to the 19th Summit," reads the communiqué of the 18th Ordinary Summit of the EAC Heads of State. Kenya's proposal at the summit was for the region to set up its own production structures and capacity to make clothing and shoes, while also pushing for the strict implementation of sanitary and phytosanitary measures (SPS) under the EAC SPS Protocol. In June last year, Kenya joined Uganda and Rwanda as the EAC partner states that complied with a ratification approval. The EAC hopes to use the SPS protocol to call for better quality used clothes that are fit for human use and dignity. The EastAfrican has also learnt that the EAC secretariat has already completed its study on how the phase-out of importing used clothing will be implemented. "A meeting is slated for later this month in Arusha, where this will be the main agenda. We will also meet to discuss and approve a detailed plan on how the region's textile and leather industry is to be developed so as to be self-sustaining," a source told The EastAfrican.